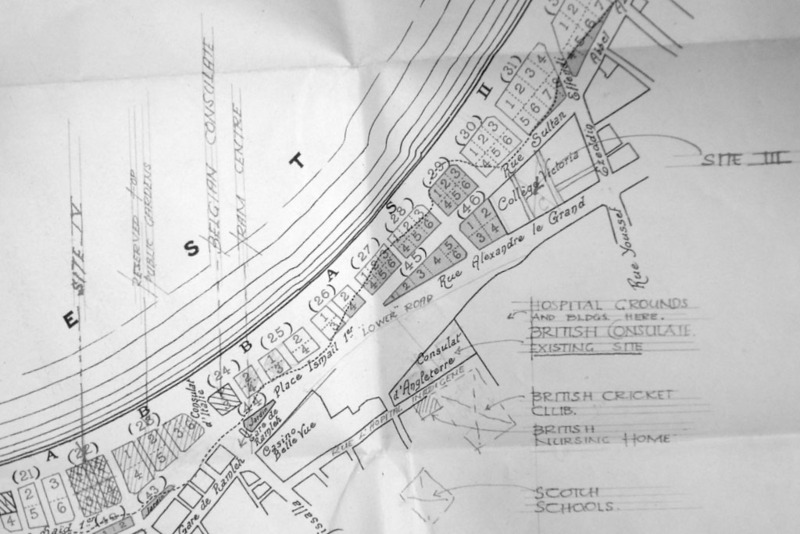 Colquhoun submitted the case for a new building to London and appended an outline plan of how he thought it should be. 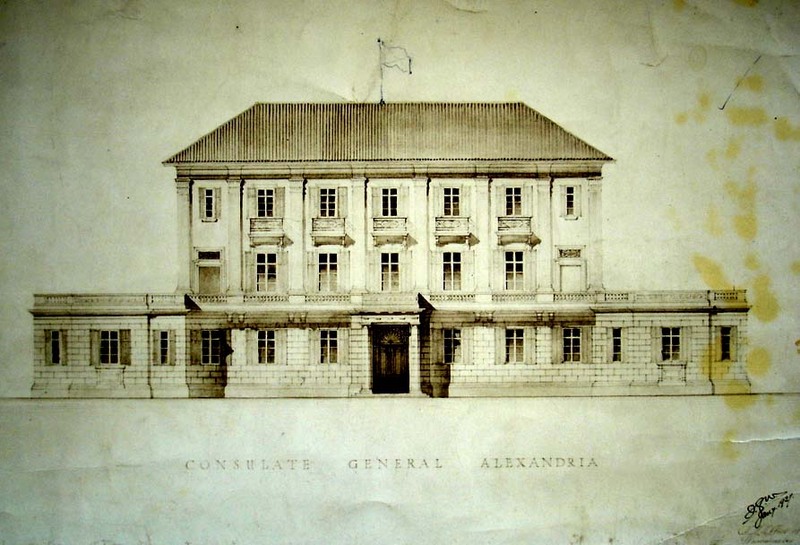 The Treasury ignored his proposals, asking instead in 1860 for a statement of need, schedule of rooms, and estimates: on receipt, it would instruct that ‘some competent Architect or Surveyor’ should visit Alexandria and produce a design. The Foreign Office asked the Treasury ‘…whether it might not be on the whole the most economical course to authorise Mr Colquhoun to employ an Architect on the spot…’. 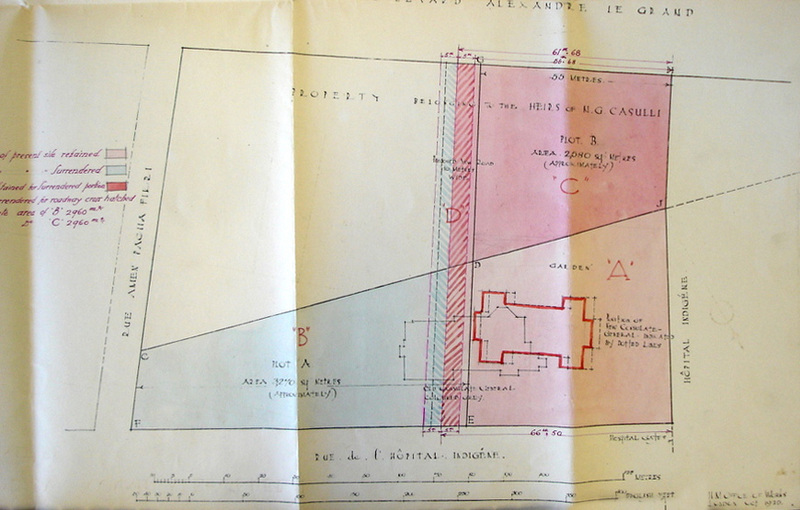 The Treasury, after consulting the Office of Works, asked that Colquhoun should indicate whether competent local architects existed in Alexandria. Colquhoun recommended one called F Sofio. Colquhoun also estimated that the total building cost would be about £12,000, and ‘… having a little knowledge myself of Architecture, I shall bring to bear my personal knowledge in making sketches of what I think may be best adopted for the situation, climate etc’. Sofio produced a three-storey design, planned almost identically with Colquhoun’s first proposal, which Colquhoun unsurprisingly endorsed and sent to London. Soon after, Colquhoun sent a set of drawings by a Carl Heinze that he thought evinced such taste that London might be interested. The Office of Works estimated that Sofio’s building might cost about £60,000 in Alexandria, and marginally preferred Heinze’s scheme. It reacted to both, though, by sending an eminent British architect, Thomas Donaldson, a safe choice, to go to Alexandria and produce a design and estimate of his own. Donaldson came up with a simpler and smaller design, based on much the same plan form, which he estimated at about £23,500. The Treasury said this was still too much to lay before Parliament. The arguments dragged on and nothing was settled before Colquhoun left Alexandria in 1865. Colonel Edward Stanton, his successor, did not take long to conclude that the building requirements had altered. In April 1867, he sent two designs to London, A and B, both rather heavy-handed, by an engineer whom he had commissioned called Martin Macdermott, They were rejected at first sight. Stanton then asked James Wild in June 1868 to produce a design and send it straight to the Foreign Office. Wild skilfully and diligently did this, and informed the Foreign Office about a year later that his estimate for the cost of the building was about £15,000. The scope and Wild’s design was substantially less, and its sophistication considerably more, than any of the previous designs sent to London. Intermittent discussions led nowhere and by 1870 everybody had lost interest in the whole idea of building in Alexandria. The rue de la Bourse building was destroyed during the riots of 1882 and the consulate was forced elsewhere, and the following year it lost its agency status when Baring established his base in Cairo. During the 1890s the consulate was in a block on the north side of Boulevard de Ramleh (today’s Saad Zaghloul Street). In 1900, a triangular site of about half a hectare was bought from the Egyptian government for £1,342 on which to build a new consulate: it was in the Missallah Quarter, a newly-developed area, and close to the Ramleh railway station. 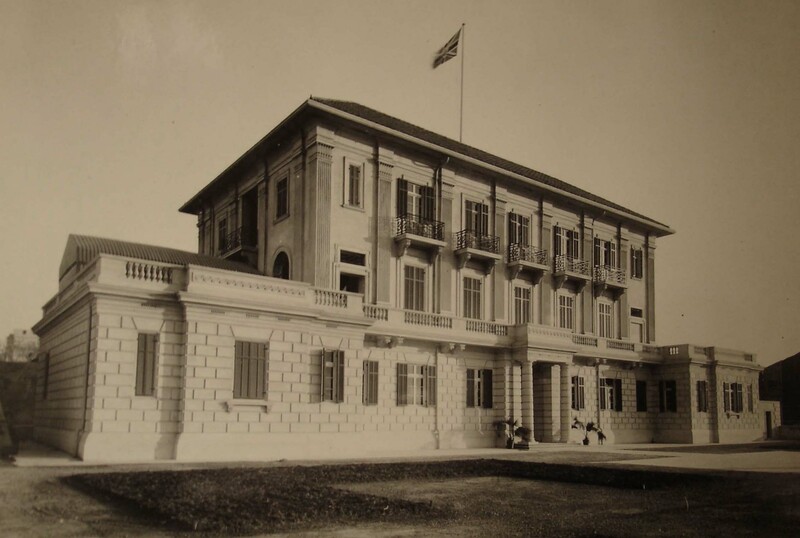 The consulate building was designed by the Office of Works in London, under the supervision of the architect Edward George Rivers. It included, besides the consul-general’s office and residence, the court, prison and shipping office. Given the slope of the site, the offices and court were on the ground floor and accessed at that level from one side, with the residence reception rooms on the first floor, accessed directly from the garden on the other side: the residence bedrooms were on a second floor over part of the building. The Office of Works, bruised by the difficulties of building to English constructional standards in Cairo, was prepared to relax standards somewhat for Alexandria. 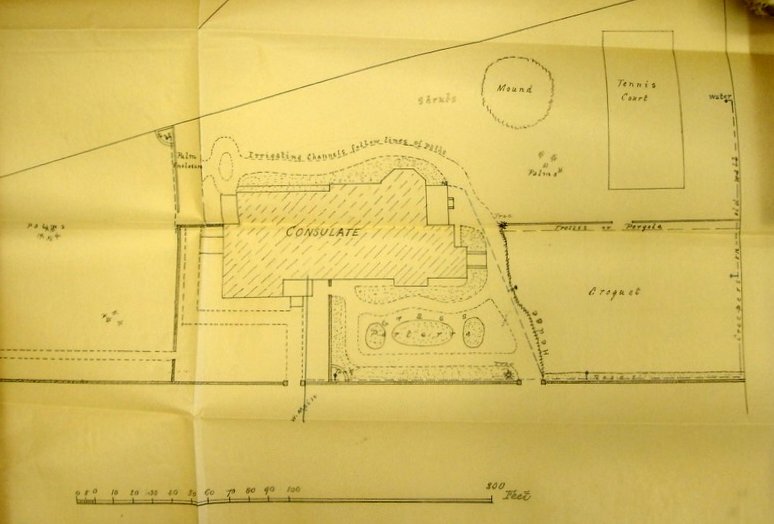 JC Willcocks was despatched to negotiate the final scheme with Cairo, write the specification and supervise the construction, for which the contractor was McClure and Dorling. The building was occupied in 1903. Two years later, significant cracks began to appear. An engineer, JE Cornish from the Egyptian Ministry of Public Works, was called for an opinion. He thought the main foundation raft was cracking from differential settlement but did not think there was a current danger to the building. Some repairs were effected in 1910, and electric light was installed in 1911. In 1913, local advice was to remove the third floor of the building but Richard Allison, who visited in that year, instead instructed the removal only of the heavy masonry parapets and their replacement by hollow cornices, thereby lightening the load on the slab by about 120 tons. This seemed to help for a while but, after further cracking, an authoritative report of 1918 affirmed Cornish’s 1905 conclusion and demolition was suggested. Allison visited again in 1919 and, though not alarmed, recommended some minor measures and more frequent observations. Hewlett Edwards, the Office of Works’ surveyor based at Constantinople, pointed out in 1923 that a decision on the future of the building could not forever be postponed. 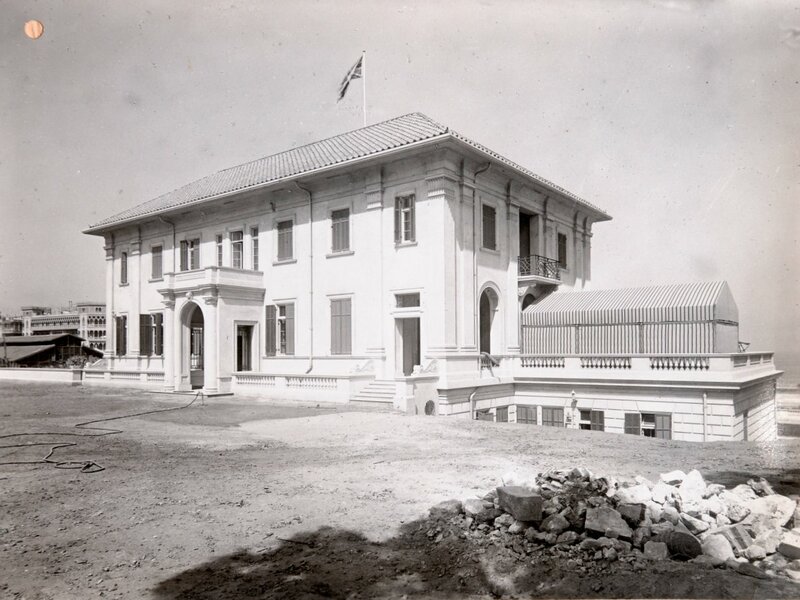 It was condemned the following year and the consulate-general moved into leased alternative premises at the end of 1924. Alternative buildings to buy, and sites on which to build, were sought without success in the following couple of years. It became apparent, however, that there was a deal to be done over the existing site by exchanging, with the heirs of NG Casulli, the sharp end of its triangle for an equivalent area of additional land at the wider end to make a good, rectangular site upon which to build a better consulate-general building once the failed one was demolished. The Office of Works in London designed in 1925, under the supervision of James Grey West, a handsome building with much the same planning arrangement as the former building but to a more rigorous specification. Four tenders for the superstructure contract were received in September 1927, three from British firms and one from an Italian firm. The Italian firm, de Farro, was lowest, at LE£18,000 compared to the lowest British offer, by DC Brooks, of LE£21,000. The minister at Cairo, Nevile Henderson, contacted London ‘I presume Office of Works have no alternative but to accept the lowest tender. I need not emphasize extreme undesirability of work being undertaken by a non-British firm, and I trust that it may be possible for Office of Works to send out new specifications on the ground that none of the tenders submitted were acceptable. In this way anyhow British firms would have a fresh chance of obtaining the contract.’ The Office of Works found its own reason to re-tender and gave the same four firms a week in which to do so. This time, Brooks came lowest, and the building, costing about £28,000, was occupied in August 1929. Its address became 3 Rue Iskander-el-Akber. Switzerland became the protecting power in 1956-9 when diplomatic relations were broken by the Suez debacle, and the consulate-general was handed over to the care of their consul. (The Canadians were the protecting power during two more breaks in relations in the 1960s.) The offices in the building were ransacked by rioters on 6 June 1967 during the Six Day War: furniture and furnishings were smashed or ruined and fires were started, but the building was not gutted. 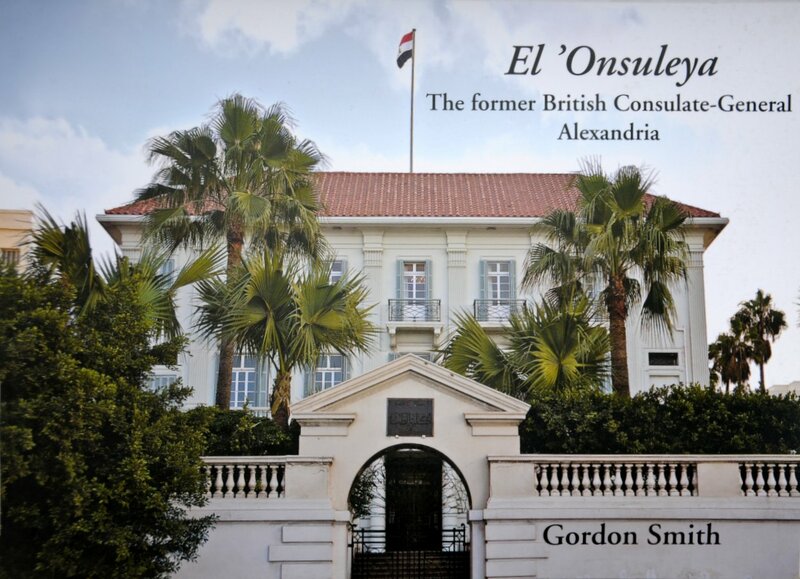 The consul-general moved straightaway into Cairo’s ex-summer residence at Ramleh, in the outer Alexandrian suburb of Roushdy. Although it was estimated that it would cost only about £25,000 to put the burned building back into repair, that proposal had few supporters. The consul-general, Alan Banks, agreed with a predecessor who described himself as ‘a glorified caretaker of a large imposing residence’. Given that the location was self-evidently no longer safe, and that the Ramleh building worked satisfactorily as the consulate-general, it was agreed in 1968 that the vacant former building should be disposed of as soon as the Egyptians paid the reparations. It then stood empty and unattended for almost twenty years. The University of Alexandria, which occupied various of the adjacent lands and buildings, was the obvious, if not the only practicable, purchaser. It had no money but exercised in effect a veto over sale to any other buyer. The Egyptian government helped the university by promising to block the export of any proceeds of sale. Nevertheless, there was the occasional optimistic prospective buyer. In 1978, sale of the building to Hussein El Baz fell through at quite a late stage, and in 1982 Sir Christopher Crossley, acting on behalf of Laing, proposed a marriage deal between the British government and the university that would result in a nine-storey office block (built by Laing) on the site: that was set aside. Eventually, in 1986, the building was sold to the University of Alexandria for LE£2.5 million. On the same afternoon as the sale agreement was signed, the Egyptian flag was hoisted on the former consular mast. The building is now part of the university’s faculty of medicine, and is well cared for. 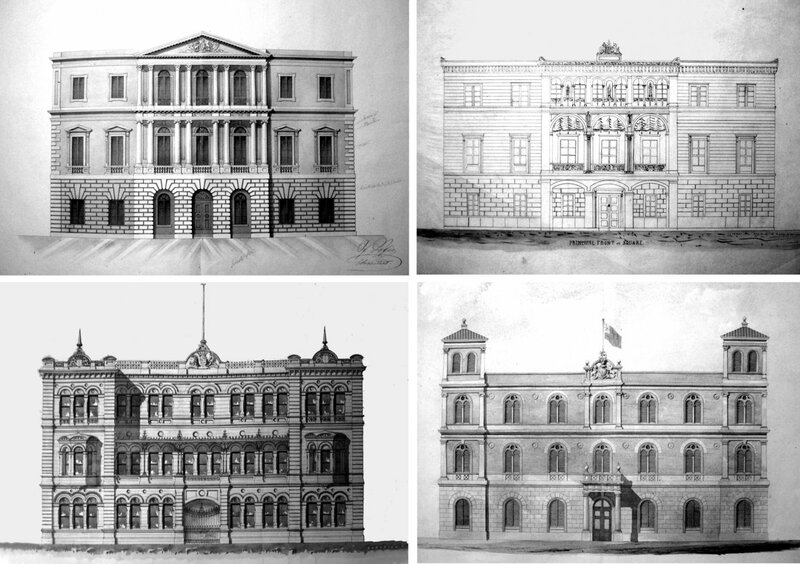 Main elevation drawings of proposals by (clockwise from top left) Sofia, Heinze, Donaldson and MacDermott. 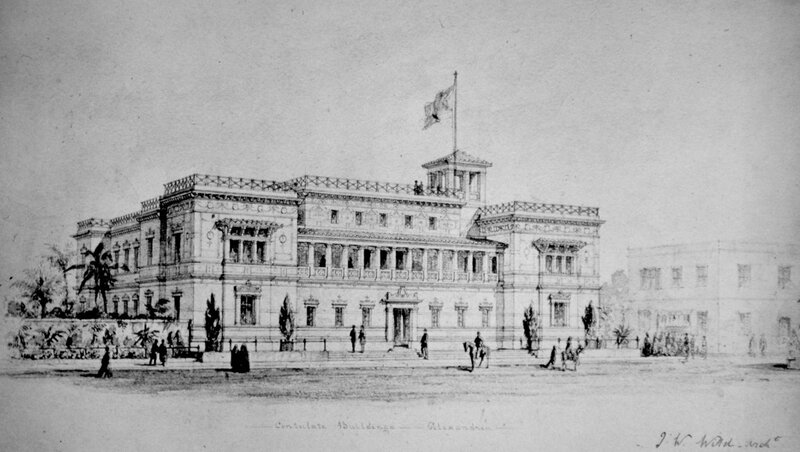 James Wild’s 1869 proposal: this drawing was exhibited at the Royal Academy in 1870. 1925 plan of central Alexandria, with triangular consulate site acquired in 1900 marked. 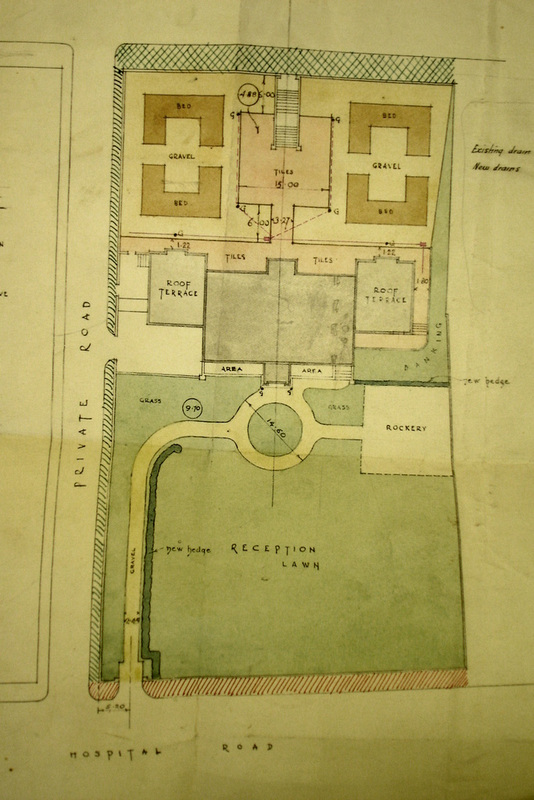 Layout drawing of proposed house and garden, 1900. 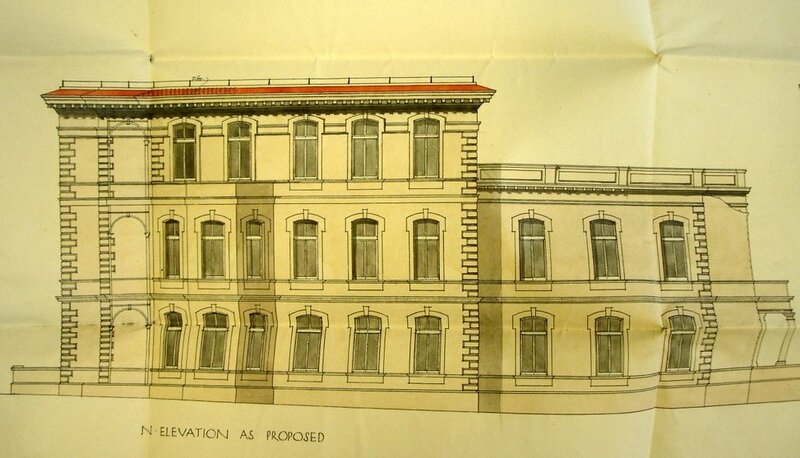 1913 drawing showing Allison’s parapet remodelling of 1903 building to reduce its weight. Transformation of site by exchanging blue area for red. Plan of revised site, 1928. 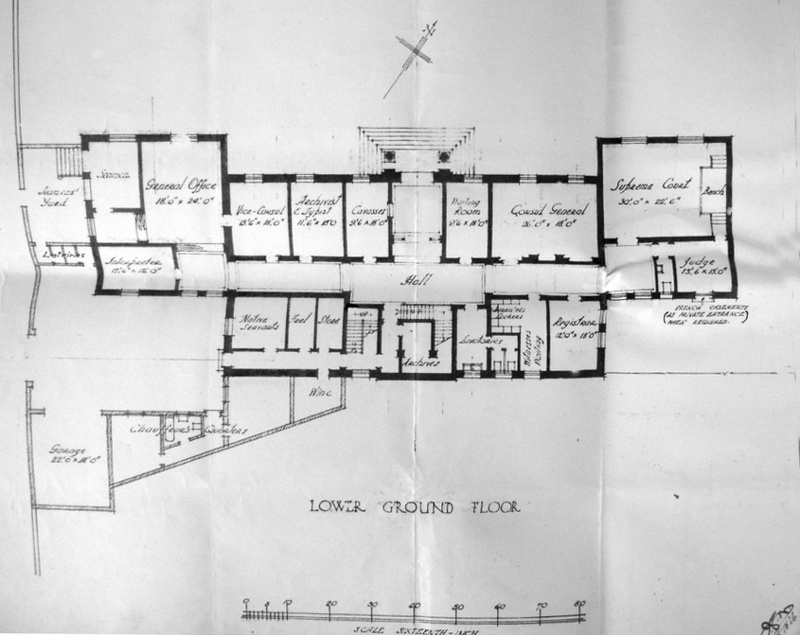 Proposed ground floor plan, 1927, with entrance to offices from top. 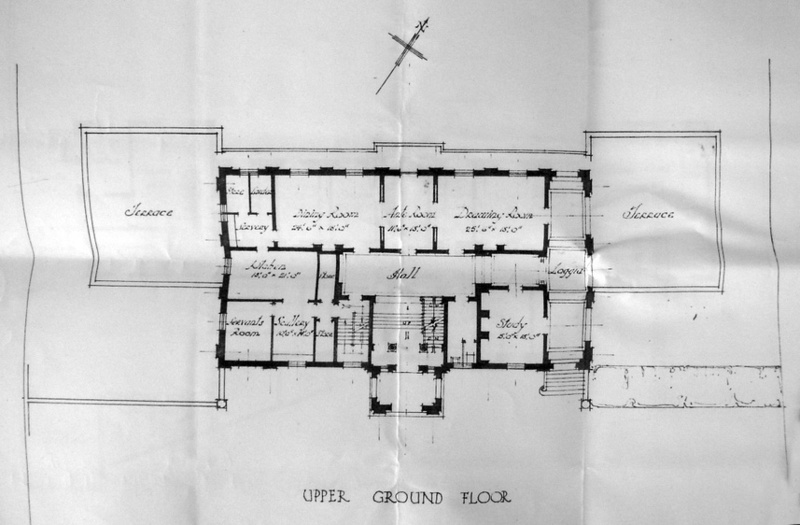 Proposed first floor plan, 1927, with entrance to residence from garden at bottom. 1927 drawing of main front of proposed replacement building. 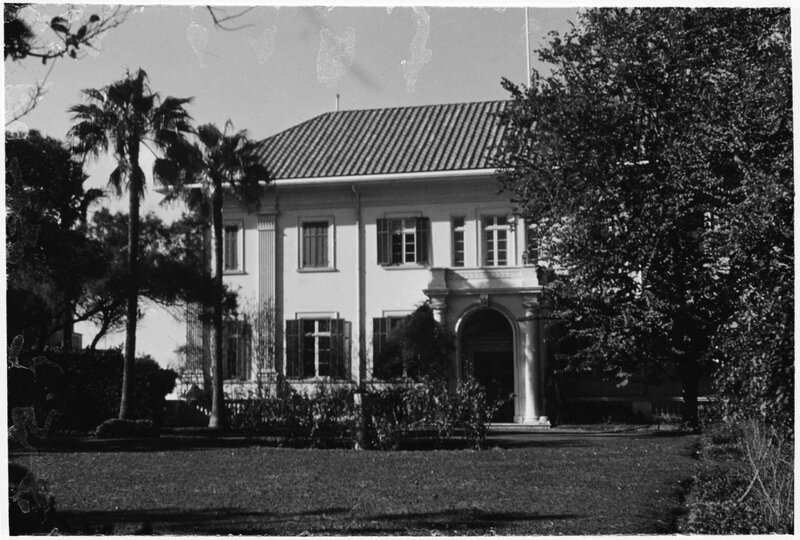 Main front as constructed, 1929.
garden front as constructed, 1929.